We now carry over 16,000 mylar balloons, latex balloons and balloon related accessories. We are expanding our selection monthly in order to serve you better. Now offering more special deals on balloons than ever before. Our online selection is now over 16,000 mylar balloons, latex balloons and balloon related accessories. We now offer more special deals than ever before. 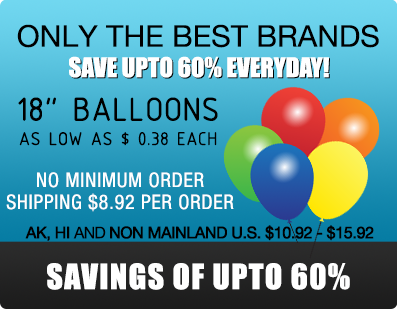 We stock over 16,000 balloon related products including mylar balloons, latex balloons, balloon weights and ribbon at prices 20-60% off pricing found on other websites. We offer hundreds of special deals available only while supplies last. 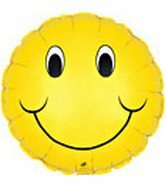 Hundreds of Jumbo Mylar Balloon Designs for $1.95 or less. 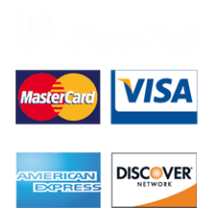 We accept School Purchase Orders direct through the checkout. Welcome to our website. Let us introduce our company. At Bargain Balloons we strive to provide the lowest prices on mylar balloons, party balloons and helium balloon accessories. We sell only quality made balloons from manufacturers including CTI Industries, Betallic, Qualatex, Classic Balloons and Convergram. We have no minimum order in quantity purchased or dollar value. 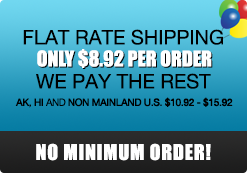 Shipping is $8.92 per order to anywhere in North America and we pay the rest of the shipping. We are able to deliver such discount prices on quality mylar balloons and party and helium balloons for many reasons including the following. (1) First of all we buy in bulk and pass the savings along to you with discounts of up to 60% off normal pricing. That means lower prices on all your mylar balloons, party balloons and helium balloon needs. (2) We supplement our normal everyday online mylar balloon selection with hundreds of special deal mylar balloons offered to us by the manufacturers and other sources so we are able to offer you the widest selection of mylar balloons available for 20-60% off normal pricing. (3) We don't bother printing and distributing expensive paper catalogs. We are exclusively an online mylar and party balloon company utilizing our online helium balloon catalog and online ordering. Unlike paper catalogues our online party balloon catalog is always up to date which means you don't have to worry that half you order is not in stock. (4) We do not have a regional or national sales force and this saves a lot of money and allows us to sell at a discount since we have to employ fewer people. (5) We avoid taking phone orders. All of our ordering is done online which saves you money. While we strive to reduce costs and prices to their minimum we still strive for excellence in customer service. Unlike many other companies we do answer all our e-mail and we would like to hear your feedback. Your feedback helps us understand your needs much better so please e-mail us and we will respond quickly 7 days a week. Please do not hesitate to email us at with all your questions, comments or special requests. E-mail is answered throughout business hours and several times a day on weekends and holidays. take orders over the phone. However, we are happy to answer your questions. Please call us at 1-866-330-1272. 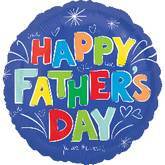 We have a great selection of Party Balloons, Helium Balloons, Wholesale Balloons and Mylar Balloons at discount prices. Get ready for Valentines Day 2018.